Listen, this is the first time and only time in your life that you'll have two full-time jobs. Academics will be full-time here at Texas Tech University. It is going to be hard. It's going to be time consuming study halls. You will have to earn a degree. Then you have to turn around and have a full-time job in football, and that's going to be just as hard. And if you can survive those two, you know, you'll leave here not just a winner and with a degree, but a better person. the new head football coach. Photo courtesy of Texas Tech. Here is the transcript from the press conference which also included Texas Tech President Guy Bailey and Athletics Director Gerald Myers. THE MODERATOR: I'd like to welcome everybody here today. We'll turn it over to Dr. Bailey and he'll start with opening comments. GUY BAILEY: Thank you very much. Thank you all for being here. I'm Guy Bailey, president of Texas Tech University. I'd like to welcome you all to one of the most beautiful college campuses in the world. This is a great day to be a Texas Tech Red Raider. Before I begin, I want to do just one quick thing. I want to thank our players. The last three weeks have been very difficult on them. I'm extremely proud of our players and our staff for the way they've conducted themselves. It makes you proud to be a Texas Tech Red Raider. We really appreciate everything you all have done. 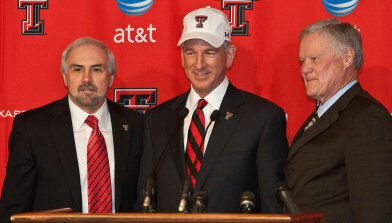 Our primary purpose here today is to introduce you to Texas Tech University's next football coach, Tommy Tuberville. When we began this search for a new football coach, we were looking for a proven winner against competition of the highest caliber. For someone who could take Texas Tech football to the next level and for someone of the highest character. And we found that man in Tommy Tuberville. In ten years at Auburn, Coach Tuberville had an 85-40 record in the conference that's won five of the last seven BCS Championships. He won an SEC Championship and National Coach of the Year and five Western Division Crowns, beat his primary in-state rival 7 of 10 times. He did a remarkable job before that at Ole Miss with a team handicapped by a small number of scholarships. He was defensive coordinator at Texas A & M the year they were undefeated, and defensive coordinator at Miami University the two years they won National Championships. I don't think we could find a better fit for Texas Tech University than Tommy Tuberville. This man is a winner. A man of the highest character. We're absolutely delighted to have him here. Now to introduce Coach Tuberville, I'm going to introduce Gerald Myers our athletic director. Gerald? GERALD MYERS: Thank you. I'm here to introduce our new coach. And I want to say that he's got great experience and great success at one of the -- in one of the best conferences, best football conferences in the country. He's won championships. He's played in BCS games. And along with all of you, our staff, Chancellor Hance, our student-athletes, all of Texas Tech, we want to wish him the best in developing a program that all of us hope that he can work and do here at Texas Tech. So it's my pleasure at this time to introduce Tommy Tuberville as our next football coach. Tommy, if you'll step up here, I want to give you a Texas Tech hat. First of all, I'm glad to be here. I'd like to introduce my family: My wife, Suzanne; my mother, Olive; and my two sons, Tucker and Troy. You know, it's an exciting day for me. I've been in coaching for a long time. Made some changes, made some moves. But when you make a move as a head coach and go to a new university, it really enlightens you. I'm excited for the opportunity. What a great opportunity to come to a state that loves football so much, to a great conference and a university that loves its football team. This football team, you'll never hear me say this is my team or anything like that. This is Texas Tech's fans', alumni and students' and faculties' team. I'm here responsible to make sure it has an opportunity to grow and get better. I know there are some things in the last few weeks that have been a small bump in the road, but that happens in life. I'm here to take the challenge on. We're going to go forward. We're going to be successful. I'm excited about the opportunity. I'm excited about the things, obviously, that have happened at Tech the last few years. There's a criteria here now that offensive football and the football in general is fun to watch. And I'm here to build on that, and I'm looking forward to that. It's going to be a great challenge. I'll be the first to tell you, being in this business a long time, being a head coach for 15 years, this is hard. This is a very hard job. Not Texas Tech University, but college football is hard. A new generation of kids coming up each year, dealing with different type of problems. A lot which I'm looking at in this room - the media -- (smiling). I'm just kidding (laughing). But it is a challenge. The first year -- a few weeks ago my wife and I were talking. Everybody knows I've been out for a year, and I've rejuvenated myself. I've been going around trying to learn different things, knowing I was going to get back into the business. And my wife has obviously gone through two moves at Ole Miss and at Auburn, starting over again in difficult situations. Both were very difficult, as this has some difficult situations. But she said, Are you sure you want to do this again? You remember how tough it is especially the first year? And it is. Getting in, getting arranged, organized, getting people around you that you feel are going to be good for the program and getting everything started with the players, the fans, and getting off on the right foot. It's a long process, but we'll do it right. We're not going to look back. Dr. Bailey and I want to thank him and Coach Myers and Chancellor Hance, I want to thank them for that opportunity. But as I told them, we're not going to look back, we're going to look forward. There's been some success here. I've had some success, but that doesn't make any difference. What starts right now forward is what's important. The first thing that's important to me is the players on this team. They've gone through a tough time. And I'll reach out to them when they get back next week. We'll have our first team meeting at 4:00 o'clock on Wednesday. I'll introduce myself to them. They don't know me from Adam. But I want to let them know that I'm here for them. I'm not here to win football games, per se. I'm not here to get them a degree, per se. My job, I'm a teacher. And the one thing that I want them to learn and understand and the parents when I recruit these kids to come to Texas Tech University, is that when they leave here, they're a better person. You know, that means more than education, that means more than football. They understand the difference between right and wrong. He they understand work ethic, attitude, and how to maintain a steady life in the future to get the most out of life. Because what these kids are facing in this generation is going to be tougher than what most of us had. So I think football is a great sport and it builds on that. You know, football is a true team sport. I've told many people this. It takes more than one person. You know, you can take a Peyton Manning and put him on this football team that we have, and not put many people around him. You're not going to win many games. You can put Michael Jordan on a basketball team, and you can win a lot of games. So it takes a lot of people in any football program to have success. So my job is to build a team that's going to be positive. Positive attitude, plus effort, equals performance. That's been my motto for a long time. I hope to bring these kids in here - the new recruits, the players that we have on the team - to mold them as a team that's going to play well and do things on and off the field well. That's very important to me. I'm the type of person that believes in being responsible to their teammates, being responsible to the people in our building, being responsible to the faculty and the students on this campus. And as we all know, if one football player, one basketball player makes a mistake, usually it's national headlines. So that's a priority for me also. I believe in a team concept. And basically that's my philosophy of building a team from the ground up. Understanding that you're going to need that guy on the right side of you. You're going to need that guy on the left side of you because you can't do it by yourself. And we'll do that starting today. I know everybody's going to talk about and want to visit about the offense. The offense will not change. The defense will change somewhat. My plans for the next few days is to go out -- I have several people lined up for interviews on offense and defensive coordinators. We will select those, and I will select those guys I feel like, number one, offense. That knows this offense, that understands it, and that can continue what we're doing offense and maybe enhance it a little bit in some areas. I am a true believer, and most of you have probably heard this. I like to run the football. Sure, I like to run the football, but I like to win. I've looked at the players on this team, and I feel with all my heart, we continue to do what we're doing and add a few new wrinkles, it will continue to make it better. But we are going to be fun to watch. So those that are out there thinking well, he's going to change everything we're doing on offense, that's wrong. We'll make some subtle changes. Most that you won't even recognize when we get to spring practice and we get to the fall. But one thing I like to do is I like to be well organized in what we're doing. I like to control the ball, and you can do that in the air as well as you can on the ground. Defensively, we're going to also be fun. We're going to try to make things happen. We're going to be very aggressive. You'll see a total change in that. We'll have a defensive coordinator that comes in and has a lot of my philosophy. And we'll bring kids in that I really don't care how big they are, as long as they can run. Speed wins for you in the game of football on both sides and on special teams. So we're going to be fun to watch on offense. We'll be very fun to watch defensively. And special teams is a big part of my philosophy. If you're going to win championships, you have to have all three phases. You have to have that. You can't have one, you can't have two. You have to be good in all three. You don't have to be great. If you go back and look at my resume over the years we've won the majority of the games we've played against Top 10 teams. Many times we have been overmatched. But having talent is one thing. Going out and playing with talent in all three phases of the football is what's important. We'll do that with discipline, hard work and attitude. We'll do it year round. That's the one thing that's changed in this game of football that I love so much that I've competed in and coached for a long time. That in college football now it is 365 days a year. Used to be it was four or five months. Now players have to be totally dedicated. And my understanding of watching and talking to the people here, these players love the game of football. And you pretty much all have to do that to survive in this sport. What I tell the recruits when I recruit them with their parents sitting in front of me - I say, Listen, this is the first time and only time in your life that you'll have two full-time jobs. Academics will be full-time here at Texas Tech University. It is going to be hard. It's going to be time consuming study halls. You will have to earn a degree. Then you have to turn around and have a full-time job in football, and that's going to be just as hard. And if you can survive those two, you know, you'll leave here not just a winner and with a degree, but a better person. That's what I always look forward to in seeing those guys put the cap and gown on and walking down that aisle, getting that degree and going off. Then coming back and being great alumni and great fan supporters of the team that they played for. But, again, I am so excited about the future. Again, I'm going to be everywhere the next six months. I look forward to going out and reaching out not just to the recruits and players on this team, but also to the fans, to the alumni, to the fellow players that have played here, the lettermen. I can remember growing up in Arkansas. One of the best players I ever saw growing up was Donny anderson. He changed, really changed, a lot of things of what I thought about football of a guy could do so many things. So I'm looking forward to meeting Donny, and a lot of the other lettermen that have been a big part of this program and put it to where it's at today. Questions? Q. What do you say to fans that are still disgruntled over those bumps in the road that you mentioned earlier, Team Leach, all those supporters? What do you say and how do you rectify that situation? COACH TUBERVILLE: The thing I say about that is because people are disappointed means that they love this program, and they want to see it get better. I convinced the chancellor and Dr. Bailey and Coach Myers that I was the guy that could do it. Again, I've done it before. I like that people are disappointed. They should be. I'm very disappointed when we lose a game, but it's not the end of the world, because there is another day. And I'm telling Texas Tech fans right now that we're going to be exciting. We're going to be fun to watch. But it's going to be your team. I think you're going to be very proud of what we put on the field. I can't tell them how many games we're going to win or how many games we're going to lose, but you'll see a team that will play very, very hard. And it will be well-coached, you know, from the time they step on the field to the time they leave. And you'll be very proud of how they do things for their university. Q. I know you met with your staff last night. Can you tell us which members of the staff you plan on retaining? COACH TUBERVILLE: Well, I really don't he know yet. In my dealings over the years -- I learned under some great guys. Jimmy Johnson, Dennis Erickson, R.C. Slocum, Larry Lacewell, some of the best coaches probably in football in my generation. And the one thing that you have to do in this business is you have to give responsibility to coaches. I'm a believer of having a great offensive coordinator and defensive coordinator. But I also believe in letting them have the opportunity to interview coaches, to make sure that they fit into their beliefs and how they want them to coach, either receivers, running backs, quarterbacks, offensive line. So what will happen is my first order of business, as I told the coaching staff last night, the present coaching staff, is that I will hire those two coaches first, and then we will sit down with each coach here on the staff. We will evaluate them and we'll evaluate other people. If we think that there's somebody out there that may make this university's football team better, we'll go in that direction. If we think that the people on this staff are the people that we think can get us to the next level, get us to the championship game to win a conference championship, we'll do that. You know, that's the bottom line. Again, I told all of them last night, they have an opportunity it's just they have to wait until they get those coordinators and we'll start from there. Q. Can you, without giving too much away, talk about what those wrinkles might look like in the offense? COACH TUBERVILLE: Well, we'll sit down. When you put together a football team the biggest thing that you want to do, and a lot of coaches have a problem with this, you look at the talent that you have on your team, and you fit your football team to that talent. Year in and year out it will change. So if you look at this team next year coming back, obviously there are a lot of good players coming back, lot of speed at receiver. But we have very good running backs. I want to be exciting. I want to be versatile. Again, I've been a defensive coach all my life. But the one thing I will tell you is that all of us that are defensive coaches all think we're better offensive coaches than the offensive guys because we study so much of offense. The thing that's given me problems over the years of defending is multiple offenses, sets, motions out of the backfield, motions from wide receivers, different personnel. Fast-paced offense. I can't really tell you at the moment what we'll look at in terms of changing. But, again, it will be very subtle in what we do. We're going to air it out. We're going to keep the air raid. I think it's something that Tech has hit upon that gives them that identity to recruit and we all want to have. We've got a great product to sell in this university. Texas Tech University is a great product to sell. I'm a salesman. I will go out every day and sell Texas Tech University. But you have something that those high school kids look at. They say I fit in there. I like what they do. I like this offense. It's given Texas Tech an identity over the last few years. A lot of these schools, not only in this state but around the country, run the same offense and it gives you an opportunity to recruit. So there's not a player in this country that's been around this type of offense that hasn't said, you know what, I know what Texas Tech does on the offense. But you can't say that about a lot of other teams. You know, they might be west-coast offense, they might be option. But most of the time the good players across this country can recognize Texas Tech from one thing, and that is the air raid, throwing the football, making big plays and exciting. And so we're going to continue that. Q. Given the timing of all this, how does it put you in a hole in terms of recruiting here? COACH TUBERVILLE: You know, it was very good. Got in last night. Quick day, very excited. At 12:06 central time, Coach Myers called me and offered me the job, and I accepted. I guess about six-and-a-half hours later I was here in town, on the phone with almost -- not all -- but all the players that I could visit with on the phone about their commitment to Texas Tech or their looking at Texas Tech with some possibilities of going on other places. The reception was great. I don't have a big ego. But the great thing about myself over the years, I have done what Texas Tech has done with an offense, I've created a name. Most players know who I am because I have been on TV a little bit, been National Coach of the Year, done a few things, and that helps. You know, when you're in recruiting, it helps to be able to sell your offense, sell your defense, but also sell the name of the university and the coach that's selling all that. So it went very well last night on the phone. I'll make more phone calls today. It was a great response. Nobody said, coach, I've decided to change my commitment. It was very, very positive. Again, we've still got a lot of work to do over the next few weeks. Q. Want to get your assessment of the Big 12 compared to your old stomping grounds, the SEC, what do you think? COACH TUBERVILLE: The main difference of both conferences is as we speak and it evolves rapidly, but as we speak, the SEC's known more for defense, and the Big 12 is known more for offense. That is the bottom line. You're looking at three of the top teams in the nation offensively were from the Big 12 this year. If you look in the SEC, there probably wasn't one in the Top 10. I can't think of one right now. But it just goes in cycles. But I like both conferences. It really excites me to have the opportunity to come over again. I was in one of the last few years on the staff at Texas A & M of the old southwest conference. And a couple years later evolved to the Big 12. But, again, in our profession and in any profession, you look forward to doing things, what people enjoy. And in this state and in this conference and in the SEC, people love college football. It gives you a shot of adrenaline. It makes you work harder. It makes you compete harder. It would be hard to compare both conferences. But if you just looked at the standout things, I would just say right now offensively that things are going much better in this conference defensively overall probably than in the SEC a little bit better. Q. How do you make a defense nationally prolific like the offense has been since you are a defensive coach? COACH TUBERVILLE: Number one, you have to have a plan. You'll find out pretty quick that I will have a plan from day one when we put our offense and defense in. We stick with it. I'm a fundamental and technique coach. When we bring players in, with we're going to teach them how to play our offense. We'll teach them how to play our defense. We're not going to take anything for granted. Again, it all starts with hard work and all those things. And to play for me, they're going to have to have that. But I believe in consistency. And if you look at all the top teams in the country, they're based on consistency. Not changing one week or one year. Hey, this looks good. Let's go to this. You change subtly. But we'll have a base offense. We'll have a base defense, and we'll build from that each week. When we play on Saturday, we won't be complicated. We'll be simple in the fact in terms of what our players think. It will look a little bit more complicated in the naked eye. But I love for our players to go out on Saturday, have fun, play hard, play fast and play with a lot of emotion. And you can only do that if you know what you're doing. Each week, again, we'll have a game plan. By the time we get there on Saturday, it will be a game plan that they'll know inside and out. But to get back to your original question, consistency on defense, consistency on offense, makes you better. Obviously, you have to have players but you can play very well with average players. When we recruit players there's two types, there's uncommon players and there's common players. Uncommon players are the Peyton Mannings and the Emmett Smith's, and Hershel Walkers, those type of guys. The common players are guys that might not be that talented, but they've got it in them to get out of it. And if you give 100% and put it together as a team, you've got a chance to be successful. So we'll look for those uncommon guys. They're not out there very often. So what we have to do and most teams across the country, even the National Championship teams, you go out and take players. Try to predict what they're going to look like in three years when you sign them. Which is very hard, by the way. But you bring them in, you try to teach them how to play. Play consistently, and if you do that, you'll make for a better football team. Q. Wondering what can the players expect from you as their head coach as far as your coaching style toward the players? COACH TUBERVILLE: Well, I delegate authority. I'm in on everything. I love to coach special teams. I think I know a lot about offense. What I do and I tell the players this, I coach coaches. I hire guys. I don't care who they are. They know what they're responsible for. They take care of that responsibility and they relate it to their players. If they can do that, then we've got a chance to win. The thing about coaching in this profession, you have to keep consistent. I think, you know, the players will enjoy what I do. I'll know every one of them. I try to every day in practice, try to go by, pat every player on the back. Say something to them. Ask about their mom, girlfriend, how's school going. I think that's important because in college football and pro football, everything is separate. You have offense and defense. They never do anything together. I'm a true believer of them knowing their head coach. That I care about them. I bring them in one time a month, each player, in my office. We sit down, we talk, we visit. And most of the time it's not about football, it's about life, academics. The little things that are bothering them. To me, that is the role of a head coach - to continue to mold players, get them on the right direction and know them all. I'm not fond of kickers over the years (smiling). But I really am. Kickers have given me a fit over the years. But I enjoy working with them because sometimes they don't feel like they're part of the football team because they're off on another field and nobody knows their name other than one time, when they go out there and miss a field goal or have a bad snap, everybody knows them then. But I try to make everybody feel like they're a total part of the team from the scout team guy all the way up to the starting quarterback that gets all the publicity. Q. Wanted to ask you to talk about your year off in coaching. How much did that help you as far as your coach philosophy? COACH TUBERVILLE: Yeah, the year off from coaching was good. Last year at the end of ten years being in a tough profession, really after 14 years being at Ole Miss, I felt like it was time to give somebody else a shot. I worked it out with the athletic director and president of Auburn, and talked to my wife and family. We took a year off. It was good. Had a good time. After the first two weeks my wife said I changed all the light bulbs in the house and was looking for one to burn out. Then she actually came home one day at 3:30 and she said for 17 years I've been able to come home and I've been able to come home and read a book with nobody here. You're here. Don't come home anymore in the afternoon. You stay gone. So I spent a lot of time obviously with my wife, Suzanne, and I. We've traveled some with the kids. They play basketball and football. I turned into a regular dad for a while and ran the bus every morning taking them to school. I really enjoyed that. But also spent a lot of time talking to coaches on the phone. I worked for ESPN, traveled some for them. Learned your side of it. And that was fun. But I also went to several of the colleges. Watched them practice. Looked at different techniques, talked to coaches, watched film. That was a lot of fun, but I missed it. You know, when it gets in your blood, you want to get back into it. But I knew that from date I got out. The I was preparing from the day I got out at Auburn to this day. It was exciting to me. It's kind of like starting over. I'm excited about this opportunity, and this university. There is no doubt in my mind that we can take it to the next level. I know a lot of people are disappointed in what happened. Lot of people probably don't care who I am. But my job is to get out there and sell this program over the next year. By the time we kick off, I think everybody will be on board. One thing I will tell the Texas Tech family, if you look at teams across the country, if you're going to win championships, bowl games or National Championships, not just the players or coaches or administrators, faculty or the city, everybody has to be on the same page. I know everybody gets disappointed when things don't go right, but if we can keep everybody on the same road to success, it will make it a lot easier. I listen to a lot of people. Again, I will be out selling this program many nights and many days over the next six, to seven months until we get to two-a-days. And I'll let everybody know what we're doing, exactly what we look like. Because, again, this is Texas Tech program, the fan's program, the alumni. I want them to know what we're getting into. And then we'll go from there. We'll have some shortcomings, but we'll have a lot of fun. And I plan on getting us to the next level. Q. Coach, regarding staff, will any of the current assistants be candidates for the coordinator jobs? COACH TUBERVILLE: Yeah. We've thought about that. I've got four or five guys on each side of the ball that are not on the staff that I want to talk to first. They'll be short interviews. What I'll do is I'll cut those down. We are meeting tomorrow as a staff. I'm going to meet again tomorrow in or land doe with the current staff. We'll have breakfast. We'll talk about things. I've got to get to know them a little bit better. Because then when we get into negotiations of who we're going to hire, there might be somebody that might impress me in terms of football that we talk about just in this staff. But as we go through it, you know, I'll just have to wait and see if anybody strikes something in me that I feel like, hey, I think they can get this job done, because we're going to talk offense and defense at these breakfasts the next couple of days. Q. What will your base defense be? What defense will you run? COACH TUBERVILLE: Here you've been based on a four-man front. And I coached four-man front for 15, 16 years. I thought there was nothing else. Then everything he involves. And probably over the last seven or eight years we've based out of a three-man front with four linebackers. And we did that because of adjustments. When everybody was playing two backs and throwing it 15 times a game, a four-man front was pretty good. Gave you an opportunity to get lined up, not real complicated. Then when everybody started spreading it out, it makes it easier to play nickel and dime defenses out of a three-man front. Replace a linebacker or two linebackers with two corners that can cover all these wide receivers that teams are putting on the field. So I like the three-man front. Now probably about 30%, 40% of the time you'll see us in a four-man front. You have to be multiple. But we'll be aggressive. We'll attack the line of scrimmage. You'll see blitzing. You'll see zone blitzing. It's hard to zone blitz out of a four-man front. But, again, we'll have to evaluate how much of the three-man front we'll put in depending on the personnel. I mean, we're not going to force anything. We're going to look at the personnel. And the big thing about playing the style of defense that I like to play now, you have to have great corners. Not in terms of speed and athletic ability, but be able to learn what's going on, because there are techniques and fundamentals that they have to do, playing inside receivers, outside receiver, so they have to pick up quickly. The two teams that you saw play in the championship game the other night run the exact defense that we'll be running, that we'll start to run. But a lot of it, again, will depend on what we run into in spring practice. But I would hope that that would be what we would base in. Q. You talk about championships and national titles, conference titles. How close is Texas Tech to all those things? COACH TUBERVILLE: Well, I think if you look, there's been times when Tech over the last few years has played as good as anybody. But you could say that, too, about Auburn when I was at Auburn. You could have said the same thing about LSU over the last few years. It all goes back to one thing: Consistency. Also the ball has to bounce right for you. But, again, the more consistent you are, the better chance. Again, I think if we continue to improve the offense, bring the defense to a level that's a championship. You can't win championships unless the defense plays. You can go back and just look at the schedule of a lot of teams this year. If approximate you live mostly on the offense, sooner or later you're not going to play very well. The weather will be bad, your quarterback's going to have a bad day, your receivers drop balls. That's pretty hard to stay consistent, but you can play defense consistent. You can win games 13-7, 10-6. That will have to happen some here. When you play the better teams, you're not going to light it up every week. But your defense can show up because your defense is nothing but wants to to go out and get the job done. There's not a lot of execution. It's just mental and running the football. So that's what I want. I want to get the team defensively to that point. If we can keep the offense continually to grow. Add a little bit of a running game, more running game than what you've had in the past, I think it will even help everybody. Then again, everybody leaves out special teams. But it is so important special teams. Now they do call me the Riverboat Gambler and I don't mind you calling me that, and we'll take a lot of chances here. But everybody says, Coach, why did you go on fourth down? Why did you kick that on-side kick? What did you fake the punt for? Lot of times people think you're doing it to look good or whatever. That has nothing to do with it. I do it for momentum. If I feel like we're losing momentum in a football game and usually it's on the road or even at home, the guys are not woken up and they're just playing sluggishly, I'll pull something like that. I'll go for a foot on our own 15-yard line, fourth and a foot. I know you're used to a little bit of that (laughing). But, again, my thought on that is to gain momentum, get the players into it. A lot of times when you do something like that, the players go, This idiot is actually trying to win this game. Let's help him out. But over the years I've pulled some good ones and some have worked, some have not. I like for it to be fun for the fans. I like for the fans to understand, if you go on a punting down to get you a coke or a bag of popcorn, you might miss something that's going to be fun. So from the time the ball's kicked off, anything can happen. And we're going to do everything we can to give us more points than the other team by the end of the game. Thank you very much.